This topic describes upgrading Pivotal Cloud Foundry (PCF) to v2.3. The upgrade procedure below describes upgrading Pivotal Cloud Foundry Operations Manager (Ops Manager), Pivotal Application Service (PAS), and product tiles. Breaking Changes: Read the Release Notes and Breaking Changes for this release, including the Known Issues sections, before starting the upgrade process. The apps in your deployment continue to run during the upgrade. However, you cannot write to your deployment or make changes to apps during the upgrade. For details about how upgrading PCF impacts individual PAS components, see Understanding PAS Upgrades. If you have not already, complete the steps in the Upgrade Preparation Checklist for PCF v2.3. Follow these steps to upgrade Ops Manager and Installed Products to PCF v2.3. 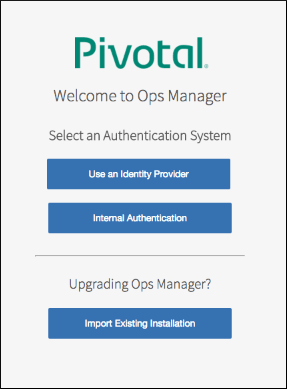 Download the Ops Manager VM Template v2.3 from the Pivotal Network site. Record the FQDN address of the existing Ops Manager VM. To avoid conflicts, power off the existing Ops Manager VM. When redirected to the Welcome to Ops Manager page, select Import Existing Installation. When prompted, enter the Decryption Passphrase for this Ops Manager installation. You set this passphrase during your initial installation of Ops Manager. Note: If lost, the Decryption Passphrase cannot be recovered. Click Choose File and browse to the installation ZIP file exported in the Export Your Installation step of your upgrade preparation. Note: Some browsers do not provide feedback on the status of the import process, and might appear to hang. A “Successfully imported installation” message appears upon completion. Import the product file to your Ops Manager Installation Dashboard. Hover over the product name in Available Products and click Add. (Optional) If you use other service tiles, you can upgrade them following the same procedure. See the Upgrading PAS and Other Pivotal Cloud Foundry Products topic for more information. WARNING: If the installation fails or returns errors, contact Support. Do not attempt to roll back the upgrade by restarting the previous (v2.2) Ops Manager VM. Click Review Pending Changes, then Apply Changes. This immediately imports and applies upgrades to all tiles in a single transaction. Click each service tile, select the Status tab, and confirm that all VMs appear and are in good health. After confirming that the new installation functions correctly, remove the v2.2 Ops Manager VM. During the upgrade, you can do the following to monitor your PCF foundation and help troubleshoot any issues. Monitor the progress of the upgrade, checking the status of the foundation at various locations. For more information, see the PCF Healthwatch documentation. See the cfdot documentation on GitHub for details. Use the CF Diego Operator Toolkit (cfdot) to check Diego component instance count by current state. Pivotal recommends this if you have a large foundation and have experienced storage issues in the past. Periodically take snapshots of storage metrics. This information helps determine the cause of upgrade issues. After your upgrade, do the following to prepare for use of your new environment, check its health status, and clean up. Reason: To log into BOSH after upgrading PCF, you need to recreate your alias. 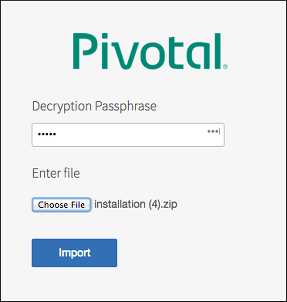 Download the version of the Cloud Foundry Command Line Interface (cf CLI) packaged with the PAS tile on Pivotal Network. Push and horizontally scale a test application. Reason: This is a performance test for PAS. If you are running PAS MySQL as a cluster, run the mysql-diag tool to validate health of the cluster. Reason: See the BOSH CLI v2 instructions in the Running mysql-diag topic. If you added custom VM Type or Persistent Disk Type options, ensure that these values are correctly set and were not overwritten. Note/Reason: Verify that the Ops Manager Resource Config pane still lists your custom options. Run bosh -e ALIAS clean-up --all to clean up old stemcells, releases, orphaned disks, and other unused resources.